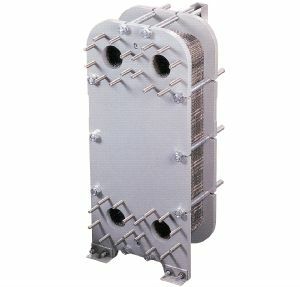 Plate and Frame heat exchangers use a combination of chevron-style heat transfer plates sequenced between a frame plate and pressure plate. The heat transfer plates have holes at the four corners forming a header that distribute the respective flows to the opposite sides of each plate when the plates align. The fluids are confined to the heat transfer surface of the plate or the port as appropriate with elastomer gaskets. Max Flow – up to 30,000 GPM with heat transfer areas up to 47,000 Sq. Ft. 1″ to 2.5″ NPT nozzle connections. 3″ to 24″ ANSI Studded connections. 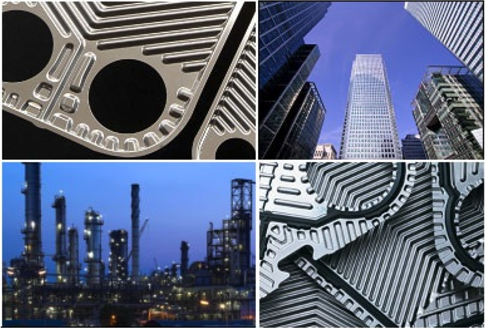 Materials: 304 and 316 Stainless Steel, Titanium, SMO 254, Hastelloy, Incolloy, AL6XN Plates. Gaskets in Nitrile, EPDM, Viton, high temperature EPDM and high temperature Nitrile. Other materials available upon request. Applications: Include but not limited to: heat recovery, equipment heating/cooling, make-up water preheating, chemical processes, central water, stator water, oil, auxiliary water, jacket water, drilling fluid. Double wall plates to reduce the possibility of fluids intermixing. Semi-welded for refrigeration or where reducing the fluid’s contact with elastomers is desired. Free Flow is ideal for pulp and paper or ethanol/biodiesel processes.